British supermarket Tesco is set to sell the new Nintendo 3DS - launching tomorrow - for £175, the lowest UK retail price to date. While stores across the UK prepare for midnight openings and 3DS launch events later today and over the weekend, Tesco seems to be pushing hard to offer British gamers the best deal on Nintendo's new handheld. Selected Tesco stores will be selling the Nintendo's 3DS for £175 from midnight tonight. 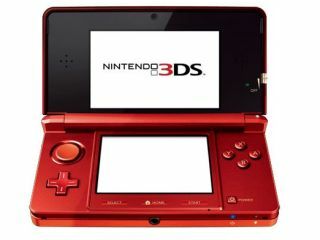 Whether or not other high street retailers and supermarket chains will follow suit, slashing the price of the new 3DS any further, remains to be seen. Amazon UK is currently listing the Nintendo 3DS at £187. Should we hear of any other UK retailers looking to match or beat Tesco's £175 3DS deal then we will update this story immediately. Meanwhile, in other 3DS news, a slip by Nintendo Greece has confirmed that a new '3DSWare' online download store is on the way soon. An unsurprising name really, following on from the previous WiiWare and DSiWare branding of Nintendo's online download stores. 3DSWare store is apparently arriving at some point in 'late May'.